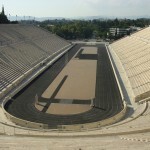 The Panathinaiko (Panathenaic) Stadium is also known as the Kallimarmaro (beautifully marbled). It was reconstructed from the remains of the ancient Greek stadium, built orginally ca. 566 BC. 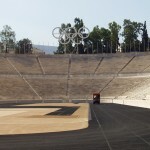 It is the athletic stadium in Athens that hosted the first modern Olympic Games in 1896. In ancient times, the Panathinaiko Stadium hosted the athletic portion of the Panathenaic Games, organised in honour of the Goddess Athena.